Lionel Messi doesn’t have to keep showing his greatness to us mere mortals, but he does so anyway out of the kindness of his heart. His latest act of generosity came against Real Betis where he scored an incredible hat trick in a 4-1 victory for his 477th win in a Barcelona shirt—a new club record. The most impressive of his three goals came in the 85th minute. Though the shot he takes sails over the keeper’s head at an incredibly tight angle, the way he moved as he was taking it was so casual that you would think that he had just scored a tap-in. 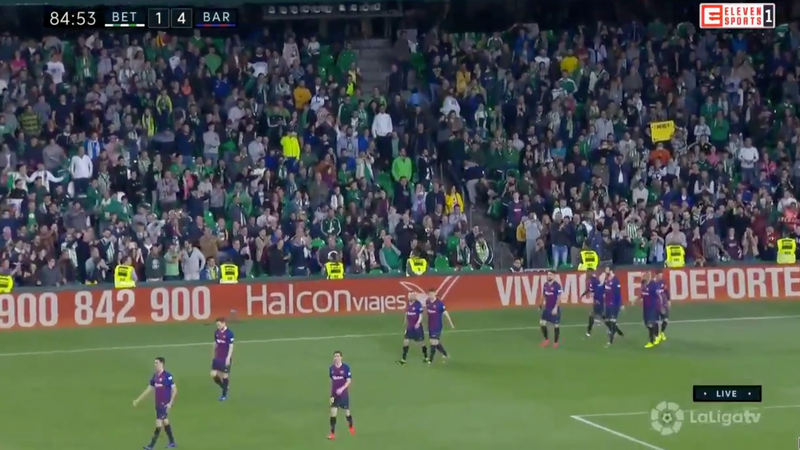 It was a goal so impressive that even the Real Betis’ supporters couldn’t help but cheer for the greatest player of this generation. Enjoy this moment because with the next round of Champions League games coming up, he’ll likely have another extraordinary performance that will knock this one out of your memories.